An article about the ill-conceived bison quarantine program that will likely be turning the majority of the progeny of these bison into privately owned livestock. The Montana Fish Wildlife and Parks’ bison quarantine project started several years ago in an attempt to create a brucellosis free heard of Yellowstone bison from captured calves which had been repeatedly tested for the disease. These calves were separated from their mothers who were slaughtered and placed in pastures just north of Gardiner, Montana where they were fed out of troughs. They have no connection to their land and have not been exposed to experienced, older animals so they haven’t learned buffalo social skills. There is a big problem though. The program wasn’t thoroughly thought out, the FWP didn’t have any takers for the bison before the program was started. The original, and often vaunted, intent was to create herds which would be used to repopulate the western public and tribal lands with genetically pure bison. There is a requirement to keep the bison that leave the quarantined facility fenced away from other animals for an additional 5 years in case brucellosis, a bacterial disease, re-emergerges. That’s expensive and nobody wants to do it so proposals to take the bison have been limited. Enter Ted Turner. He has offered to keep the bison fenced, at a cost, for five years but he wants 190 of the progeny expected to be produced during those 5 years so that he can improve the genetics of his own commercial buffalo operations. This is the polar opposite of what was originally required of the recipients of the bison. The plans specifically mandated that the bison would not be mixed with hybrid bison and that they would remain in the public trust. The Montana Fish Wildlife and Parks has said that the other major proposal to take the bison to Fort Belknap is not serious in nature and that they would have to slaughter them if they can’t give them to Ted Turner. They frame the issue as if slaughter is the only other option. But, is brucellosis really a problem in the modern era? Brucellosis has been used by the livestock industry as a way to control wildlife for decades. Montana ranchers constantly claim that buffalo are a big threat to their industry but rarely do they ever consider management of elk in the same way they manage buffalo. The ranchers also claim there would be an economic catastrophe if Montana lost its brucellosis free status but when that happened it turned out to be only a minor inconvenience. They occasionally hype up the threat to human health but exposure to the disease is rare and usually occurs at slaughtering facilities or when someone is not careful butchering an animal that has been infected. As pointed out earlier on this blog, the main threat from brucellosis came from unpasteurized milk which is illegal in most states. APHIS, who makes up the rules, has been working for decades to rid the US of brucellosis but they have hit a roadblock in the Greater Yellowstone Area because the disease has become endemic in wildlife such as elk and bison. There is no feasible way to eradicate it yet the ranchers and APHIS have called for eradication of the disease in wildlife. To truly eradicate the disease would be a colossal endeavor that would likely require massive capture, test and slaughter operations for elk, bison and other animals with the disease inside Yellowstone National Park and surrounding areas. If the disease is missed then undoubtedly the herds would become infected once again. It’s just not possible. Meanwhile APHIS is developing a plan which would call for more testing in the Greater Yellowstone area so that infected cattle won’t be moved outside of the area. Essentially they are trying to protect ranchers who live far outside the effected zones from losing their brucellosis free status by creating hot zones rather than classifying entire states as a threat. The Montana Farm Bureau Federation has recently raised a ruckus because they don’t like the idea. I suppose some don’t like the idea because it gives them less leverage to control wildlife in Yellowstone which would no longer be a threat to those who live outside of the hot zone and they would have less to lose if only the hot zone loses its status. Some want to maintain that political power over the entire state, they want hostages. Another issue related to brucellosis is the feeding grounds in Wyoming which act as a petri dish for brucellosis and, soon, chronic wasting disease. Each winter the state and the US Fish and Wildlife Service feed elk on winter range in an attempt to keep them from migrating into nearby agricultural fields and publicly owned BLM lands reserved for cattle. Hunters like this because it keeps the elk population artificially high and ranchers like this because they claim that it keeps elk away from their cattle and limits exposure to brucellosis. In any event, these feed grounds keep the instance of brucellosis high and are going to be a real threat to the elk, deer, and moose once chronic wasting disease becomes established if it hasn’t already. Some have proposed plans to vaccinate Yellowstone wildlife and I expect that there are going to be plans to do so soon but there is no effective vaccine for brucellosis and testing on bison has been very limited. I imagine people laying awake at night scheming up plans of how they could rid the entire Park of bison and elk to make the world safe from this horrible disease. These bison could help repopulate the West. So why is it so hard to find them a good home? Also, did people get a chance to see “Buffalo Battle”? It was very, very good. We had a small group at my house last night, and I know it helped my friends understand things better – people already committed to the buffalo. I really don’t have anything much to add to this. You’re absolutely right on all points. I do want to emphasize that for a quarantine program that has been touted as using disease free Yellowstone bison as pioneers of the 21st century Buffalo Commons, the failure to identify and secure recipients of quarantine bison ahead of time was and is a huge weakness of the program, and will probably sink it, all other things being equal. I think the biggest reason there are few takers of quarantine bison is not the expense of maintaining them behind fences for another five years to continue testing them for brucellosis but the determination of the livestock industries of the various western and Great Plains states to keep wild, free-roaming bison off the landscape, disease free or no. They don’t want the competition with cattle. The very premise of the quarantine program–to restore wild free-roaming bison to the landscape–is invalid because there is every indication that the various states will actively oppose putting bison on the landscape. The livestock industry will never accept wild, free roaming bison; domestic bison managed as livestock is another issue. That’s the beauty of the Turner proposal; it maintains the status quo of turning wild, free-roaming bison into livestock. I believe restoration will have to proceed without the industry’s blessing and against its opposition. This is one reason why the Tribes are such critical players in bison restoration. They don’t need livestock industry approval to restore bison to reservations. Ms Rosner’s piece is accurate as to most of the facts around the quarantine fiasco, but unfortunately it falls into the propagandistic “brucellosis is a problem for the livestock industry” narrative that is used to justify bison and elk mismanagement in the Greater Yellowstone. She accepts, for example, that brucellosis is a huge economic threat to the livestock industry. This isn’t true, as I discussed in a short column in NewWest last year here: http://www.newwest.net/topic/article/the_true_cost_of_brucellosis/C38/L38/. Nor is it true, as you note, that the only alternative to giving these bison to Turner (illegally) is slaughter. That’s more propaganda being used to justify an illegal but politically easy act. There is nothing in the Fort Belknap Reservation proposal that disqualifies it from receiving these bison, and there are a number of Montana Fish Wildlife and Parks owned “wildlife management areas” that could serve as homes for Yellowstone bison, not only for the five year probation period, but forever. The Beartooth WMA east of Helena, for example, is beginning to look good to a number of us bison conservationists. The true story about brucellosis is not the “brucellosis problem” as the livestock industry claims, but the “brucellosis fraud.” Once again, the fraud is that bison and elk mismanagement isn’t for disease control, but wild and free-roaming bison and elk control. Feedgrounds and capture, test, slaughter, vaccinate, and quarantine programs have one purpose only–to sustain the political power of the livestock oligarchy to control wildlife, to control land, and to prevent democratic decision-making about land and wildlife. The brucellosis fraud is about keeping an obsolete oligarchy on top and in charge. It’s about denying and obstructing the public trust. They’re about privatizing and commercializing the commons, the heritage of all of us. This is the story we have to keep pounding on to convince the public that our common heritage is being destroyed by this mendacious, rapacious, and brutal oligarchy. I don’t have a TV and so didn’t see it. Do you know if Buffalo Battle will be available on DVD any time soon? I very much want to see it and would like to show it here in Dubois sometime. I should have made a post about the show yesterday but I was on the phone all day for the BFC board meeting. I am unaware of any plans to release the show on DVD or to stream it. If it will be made more widely available, I will let people know. I watched “Buffalo Battle” and had to switch it on and off as I could not watch the slaughter scenes or the scenes of the baby buffalo with the broken leg. That idiot with the Montana DOL tried to blame the BFC for the little buffalo having a broken leg! This made me realize that I have helped a little in contributing to BFC and I will continue to do so – they are brave and many seem to have put their lives on hold in order to advocate for the buffalo. I hope the film gets a wider audience as I am not sure how many people watch Planet Green – only those of us who care about the planet! In an economy where everyone’s hurting, I would give priority to donating to the Buffalo Field Campaign and Western Watersheds Project. Ken……I watched it at Tom W’s house after your meeting. Talked with Mike about it’s distribution and it sounds like something was signed preventing that and I’m not sure of the details as I had to leave. My thoughts were to do with it as has been done with “Lords of Nature”…and that film is circulating throughout the country. Doing a search of “Planet Green” seems to indicate that they’re tied in to “Discovery”. How long have some of these buffalo been quarantined? Wasn’t the original plan to relocate them somewhere in eastern Montana? At this point the buffalo are pretty much livestock or zoo animals. The original idea was to use quarantine bison for bison restoration on public lands or reservations, but no specific place was actually targeted. 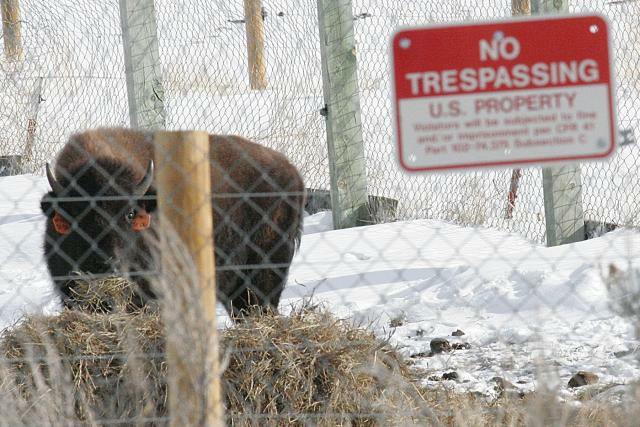 Comments on one of the environmental assessments (for phase II/III of the quarantine program) caused the agencies to say they had a preference for keeping these bison in Montana. The idea of quarantining Yellowstone bison and then sending them to reservations was first floated by the Fort Belknap Reservation (northeast Montana) in 1993, then picked up by the Intertribal Bison Cooperative when it was formed in 1994. The National Wildlife Federation glommed onto the idea in 1996/1997 but then started acting as if the idea was theirs. It wasn’t. It was a Native American idea. Quarantine was blessed by the Interagency Bison Management Plan in 2000, but didn’t get off the ground until 2004 with a proposed quarantine feasibility study (QSF) by Montana Fish Wildlife and Parks and the federal Animal and Plant Health Inspection Service. One of the major criticisms of the QFS was that the agencies made no attempt to identify and secure recipients for QFS bison before beginning the experiment. It was all left to a vague “public lands” or “tribal lands” future. The agencies said that identifying and securing recipients was “premature.” As we now see, it wasn’t. Ken, great piece! Nice writing. Press on wild warriors! And thank you all for everything you do. As much as most us dislike the intensive tech-vet approaches of both the IBMP and the Quarantine Feasibility Study (QFS), as long as we’re stuck with both it is imperative that we hold the agencies to what they have promised to do, as limited as those promises are. In the case of quarantine bison, the agencies promised that these bison would be used for bison restoration on public or tribal lands across the American West and Great Plains and that they would not be privatized and commercialized. The agencies also wrote these promises into legally binding decision documents upon the completion of environmental assessments for the QFS under the Montana Environmental Policy Act. Agencies are legally obligated to follow their own rules and decisions. They just can’t abandon them willy-nilly. If they do want to change rules or decisions, then they must start over from scratch. I see no reason to allow the agencies to break these promises and legally binding goals just because it’s now politically expedient to do so. After all, it is in the common interest, if not in the interest of the livestock industry, to restore wild, free-roaming bison to the landscape at the largest scales possible. These bison need to come out of quarantine; let’s put them where they belong–on public or tribal land. Unfortunately, and once again, the agencies have succumbed to political pressure from the livestock industry, in this case pressure exerted through Montana Governor Brian Schweitzer, who has proven to be no friend of bison or wildlife conservation as well as a liar of the first rank. Let’s hold government accountable and force it to keep its word. Is the Hillary Rosner article incorrect in stating that the Fort Belknap Reservation proposal was rejected this round, because it was just too vague, and that if they firm up their proposal and get ready in the next year and a half, they will likely get the second batch of these calves in 2011? Sounds like they did not put together a very good proposal – and there apparently was a ranking of each based on some criteria, with a need to get calves to custodial care within the next 3 months (March 2010). And, notwithstanding the fact that MFWP didn’t think this thru, is it wrong for Turner to ask for compensation for quarantining 88 of these animals for the 5 year period? I do not know what a reasonable take of progeny from this herd would be during that period, in lieu of an estimated cost of $480K for custodial care (which the state apparently does not have for this purpose), Turner wants progeny from the original 88 animals. The article says Turner wants 150, not 190 as you state. What else can be done at reasonable cost to ensure these animals are available for the future? Is Turner too greedy, or just a businessman taking advantage of an agency caught between a rock and a hard place, because of poor planning. Anybody actually know what it would cost to take over custodial care of these animals for the desired period, ensuring they were securely penned, properly fed, receive proper monitoring for the continuing research study, vet care, and other herd management tasks? And, would it be possible to introduce to the group other more socially adept disease free bison to fill the culture void? Excellent essay! Great comments from Robert, too, as usual. Many thanks for keeping us all apprised of the issues, gentlemen. The more things change, the more they seem to stay the same . . . but one of these days if everybody stays in there fighting the battles, we may win the big one! We don’t have the vast knowledge and the historical understanding of all these past agreements and whatnot, but we’ll keep supporting BFC with our monthly donations. And Robert, we always learn some great fact to put into any comments we file from your remarks in various articles! So thanks for doing our research for us! Didn’t get to see the Planet Green production here in NE Oregon either — too high a price on our satellite provider — but we sure want our names on any list of DVD or stream. if/when available. We did stop by to see the BFC headquarters last September – Mike was in Jackson and it was pre-season so we only met barb and got the “grand tour,” but it was great to put a face and a place in our sights! Thanks Ken and Stephany for keeping up the fight. I wish I could help out in some way.